Did you know your Membership with Carolina Tiger Rescue is your ticket to more than a visit with the cats? We make you a partner in our efforts to save and protect wildcats in captivity and in the wild. 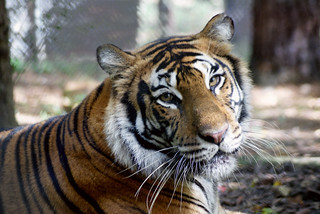 Your membership strengthens your connection to Carolina Tiger by providing access to Carolina Tiger Rescue “family” emails, members-only emails, and members-only events. Best of all, when you join Carolina Tiger Rescue, your membership dues provide valuable financial support for the magnificent tigers, lions, cougars, ocelots, servals, kinkajous, and coatimundis in the sanctuary. Check out our NEW Membership levels and benefits – offering more flexibility for you and your guests! Our Membership program offers a lot of flexibility so you can introduce more guests to Carolina Tiger Rescue! Memberships purchased prior to March 1st will remain the same.